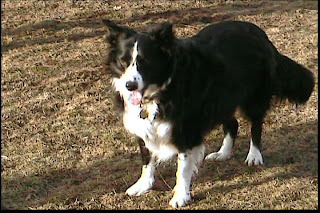 Another post reflecting on Hayley's tenth birthday, ten years of living with the Queen Terror of the Dog Parks. If you want to skip right to the fun stuff, there is a video at the bottom of this post. This is itty baby Hayley, right after we got her, just a girl having fun, before she realized she was a working dog. There is no doubt that Hayley means the world to me, and Collette as well, but I really wonder why that is. What is this connection between dog and human and human and dog ... that may be part of it right there. I feel a connection to Hayley and I'm pretty sure she feels a connection to me. Yes, and beyond the obvious "Hey dude, you feed me and if you stop that I would die or at least scrounge for bagels and lox and since I can't leave the house I'd still die" situation. In my last post I mentioned how Hayley seemed to bond with us so quickly. I took her away from her her mother, her litter mates and her farm yet very quickly she seemed to accept her new situation, her new role, her new pack. Is that it? Humans are family creatures, certainly Collette and I are. Four siblings for her, seven siblings for me and for me, if memory serves me correctly, life at home with the fam could certainly qualify as being a "pack." Collete and I have had a dog since the first year we lived together and I am pretty sure we have had our cat Gypsy since the days dinosaurs ruled the earth and spam was a luncheon meat ... well, he's been alive that long at any rate. 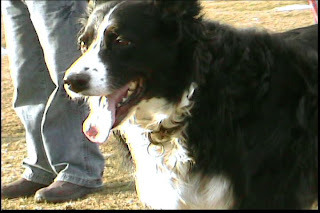 Gigs was a great dog, we had him a long time and I regret none of the time we spent with him. But Hayley is different. Our connection with her is different. There is something there, something intangible and relevant and unquantifiable and demonstrable that you would have to call it love. When Hayley is just laying around, either on the couch with us or on the floor at our feet, she always wants to touch us. When we were visiting Collette's parents up north, her mom was laying on the bed with Hayley. Hayley kept moving towards her and Marg kept moving away till she was on the edge of the bed. "She doesn't want to share," Marg said. No, she does want to share, she wants to share you. She wants to be with you. To feel safe? To have warmth? To know your smell? Hell, that would be love .. only without the roses. Hayley has been the easiest dog I've ever trained. Why is that? Is it my awesome dog whispery dog training skills? Um ... no. 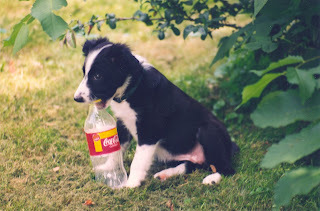 Is it the border collie's inherent intelligence, omnipotence and overall mastery of the universe as we know it? (OK, Hayley dictated that last line .. see, she's just freaking smart.) 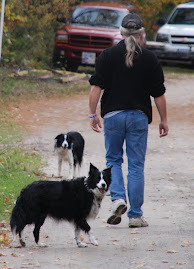 I once heard an Irish shepherd (and who would know more about a border collie) state that it really wasn't the breed's intelligence that distinguishes them (Hayley, stop frowning and growling at me, its unbecoming a girl your age) but rather it was their loyalty. That's why they are easy to train. They want to please you, they want to work with you, they want to connect. Its a mutual thing of course. I don't think you can force a dog to any anything. You certainly can't use force on a dog. Any dog. And brother, you can't do that with a border collie. Hayley is trained, when on lead, to walk on your right. Sometimes we need her to switch sides. Yanking on that lead is not the way to perform the correction; saying "other side" or "over" is going to get the job done quickly. That is my part of the bargain. I am going to treat her with love, with respect and she's going to do her job. 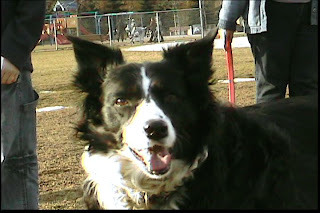 Not that she's never had a spanking but now just the word "spank" will make the bum drop and the border collie snap to. Its mutual. I don't scream at her, and she doesn't pee in my Reboks. So yes, there is a very real connection between Hayley and us. But where does this connection come from? Well humans and dogs have been doing this dance for thousands of years and they've done it in pretty much every culture. We made these guys. Sure, there's still wolf in every dog. I've read that border collies actually have a lot of wolf in them; watch a working collie coming up onto the sheep, low to the ground, head flat, ears up, moving slow, shoulders bunched ... you can clearly see the predator stalking its prey. But Hayley, as much as she loves to stalk inert tennis balls, is no wolf. She is a dog. A dog bred to work, to be loyal, to hunt the prey down but right before that oh so juicy moment of pure canine fantasy ... give up the prey to the alpha dog. And not even get a succulent piece of mutton in return. Get a pat on the head, or a cookie, or some slow cat to chase. If we made them, do they belong to us, on some genetic level? Maybe. But just having the baseline "genetic" connection is not enough. We've all seen dogs and humans where the connection is not present, its almost like there are two entirely different species in the room ... Ok, I put that in there just to see if Hayley is paying attention. "Different? What is this different you speak of kimo sabe?" The connection we have with Hayley is more than that. It is different, it is deeper, it is more personal, I truly believe that. Others have pointed that out to us. When Collette shows Hayley the nail clippers, our dog rolls onto her back and sticks her paws in the air. Hayley trusts Collette. And perhaps that's it. Trust. When Hayley was the puppy you will see in the video I was chasing her in the yard and accidental kicked her in the head. She ran yelping into a bush and would not come to me for a long time. Now, if something like happens, she comes right to me and wiggles and wiggles and touches my hand as if saying "you hurt me but I know it was an accident wasn't it?" Trust. Loyalty. A cold nose on a warm hand. That's a connection. You can over rationalize this connection (gee, Vic, isn't that what you've been doing for a whole page?) and I enjoy thinking about but, really, that ain't so important. The connection is there, the bond is strong and as Hayley enters into her eleventh year it just grows stronger every day. Where it will lead us? I don't really know, but some times, when we are quiet and laying together in the hammock or on the couch and I look into Hayley's and see that is looking back at me .. really looking back, right into my eyes in that border collie way .. I have a feeling that even if I don't know, she certainly does.